At Hardhead Diabetic, Inc., it is understood that finding competent answers to your questions is usually difficult for the personality type of a Hardhead Diabetic. Feelings of harassment - while well-meaning - from family and friends coupled with the confusing information you receive from doctors and medical professionals does not allow time to find the information for which you internally search. Classic Diabetic Rules™ are ingrained in our culture. Our books deliver frequently ignored non-traditional alternatives that actually work, provide over-looked exceptions, and reveal myth-busters for conventional diabetes treatment. We offer two guides for the independent mind. The information contained in our books will show you how to enjoy the foods you love while decreasing blood sugar levels. 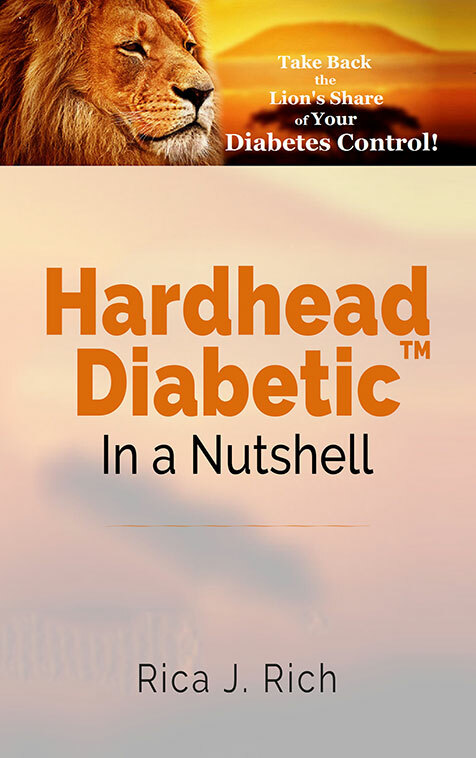 Hardhead Diabetic In A Nutshell is our introductory book. It comes in three versions. A paperback book, a PDF e-book (for PC's and Doc readers on mobile devices) and a Kindle option (for mobile devices). All are available for order now. It highlights and condenses a few of the main subjects found in our flagship book Hardhead Diabetic: Confessions of a Dangerous One, which will be available in the coming months as an e-book and in hardback. Read more about these great guides below. For our customers who enjoy getting right to the heart of the matter, this book offers an abridged version of a wealth of information. Hardhead Diabetic In a Nutshell is 150 pages of insightful advice which confronts current diabetes treatment protocol. It is an easy read focused on clearing much of the pervasive confusion in the diabetic community regarding what a diabetic can eat. In a fun way, it shows diabetics how to maintain good blood sugar levels while simultaneously retaining the joy of eating many of the foods they love but have been admonished to avoid. The prime feature of the book is its lessons on the tenants of Diabetic Food Combining. This process will help all diabetics but, offers particularly encouraging assistance to those diabetics considered to be "hardheaded" when tackling their diabetes care. Finally, the ultimate goal of this book is to help eliminate diabetic complications in the segment of the diabetic population who struggle to stay away from sugar and the foods they enjoy. This book will reveal why it is a struggle, demonstrate tested methods to keep eating many of those foods without creating unmanageable blood sugar spikes and explain to the family, friends and medical professionals of the Hardhead Diabetic why their pleas have previously fallen on deaf ears which now may be opened thanks to the information outlined in this book. I WANT TO ORDER. Be among the first to start learning how to make significant strides towards overpowering diabetes. Like the feel of the pages flipping through your fingers? Or need to expand the bookshelves of your personal library? Ships Dec 5th. Arrives in time to give as Christmas presents! $14.95 (+$4.00 S&H) BUY PAPERBACK NOW! Download the PDF e-book today for only $9.95 (+$2.00 PF) and receive 30% off Hardhead Diabetic: Confessions of a Dangerous One BUY E-BOOK NOW! Need your copy for Kindle $9.99 on Amazon BUY KINDLE VERSION NOW! The saying "knowledge is power" could not be more true when you are a diabetic. Get the information you need about overpowering diabetes in Hardhead Diabetic: Confessions of a Dangerous One. In this book you will learn about the "Hardhead Diabetic" personality type, advise for family and friends on “getting through” to your loved-one using Connective Diabetic Education™ techniques, details of “Diabetic Food Combining™,” the emotional toll of diabetes on the diabetic, lessons on persevering through the rough mental times brought on by diabetes, how to feel guilt free and get back on track when you miss a few steps, guidance for finding good diabetic medical care and much more. With your purchase of this book, you will receive free motivational aids to help stay the course during bouts of frustration. Written by a diabetic who has navigated the disease for over 25 years, this book offers guidance for those having difficulty living with diabetes, while giving loved ones and medical professionals a new view on the people suffering from it. Find out how to stop diabetic complications from infiltrating your life by attacking them from a new direction. 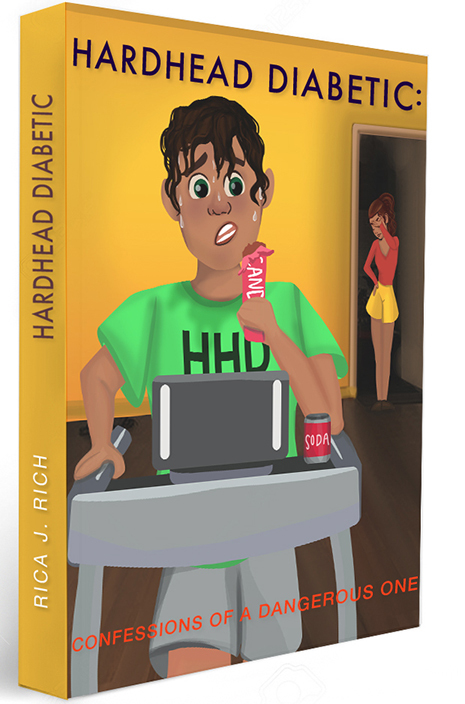 Hardhead Diabetic: Confessions of a Dangerous One is Coming Soon! 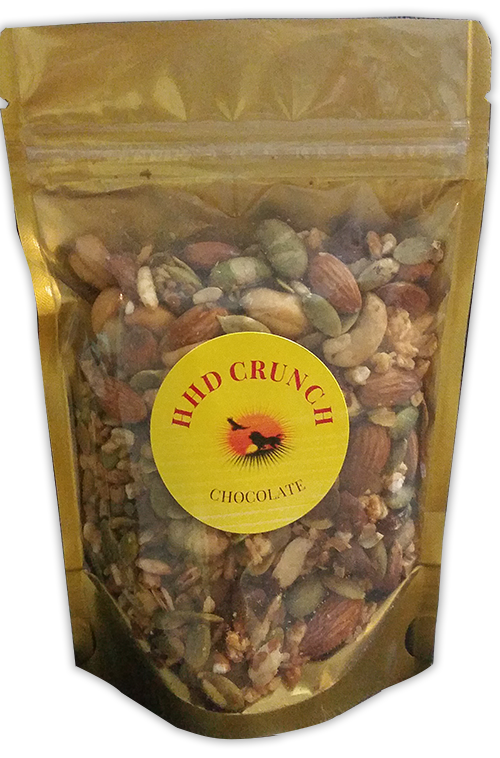 Our snacks are great for mindless munching. 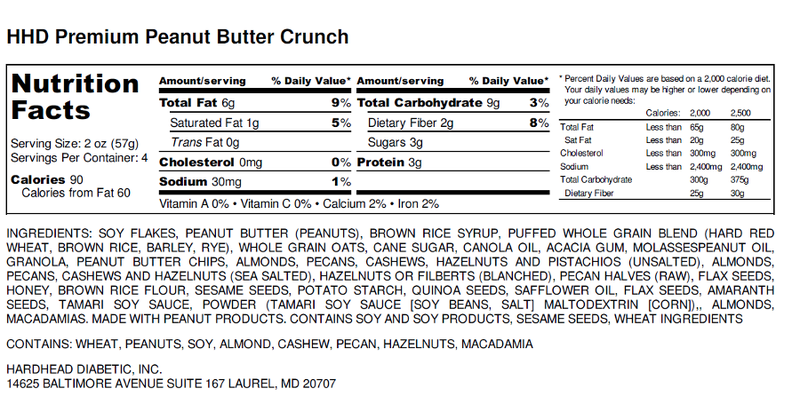 Enjoy sweet, salty and crunchy all in one. You are actually able to eat sweets without the usual guilt. Best of all, no prolonged blood sugar spikes. Find out why in our books. We currently offer 3 varieties: Chocolate, Peanut Butter & Caliente (hot). 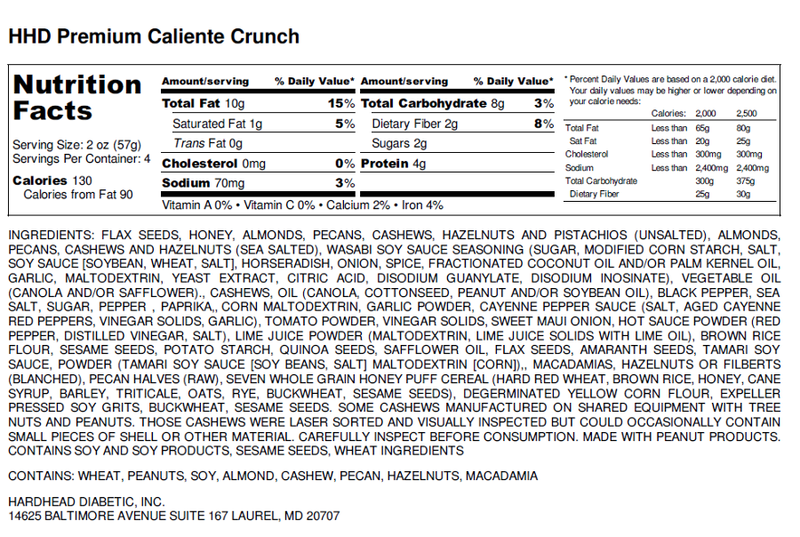 Please view the nutrition labels for content information.